The sense of humour played a major part in maintaining the morale of both troops and civilians during WWI. Humour was a response to fear, boredom, isolation and adversity. Humour fostered solidarity and helped shape a group identity against a common enemy. It nurtured resilience and helped men cope together with fear, hardship, deprivation and loss. In 1916 some British officers in Ypres discovered an intact printing press in the ruins of a bombed out building. They decided to use the press to create a satirical newspaper to entertain the soldiers and to raise their spirits. The Wipers Times was named after Tommy slang for Ypres. The paper consisted of poems, reflections, wry in-jokes and lampoons of the military situation. 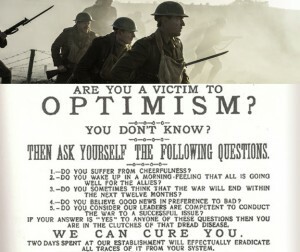 In 2013 the BBC broadcast a dramatization of the story of The Wipers Times. ‘Are You A Victim Of Optimism?’ appeared in The Wipers Times in July 1916 in response to the Battle of the Somme, where 19,240 British men died in the first day of fighting. It is a typical example of the magazine’s gallows humour.